People will complain about anything — not almost anything, but absolutely anything! 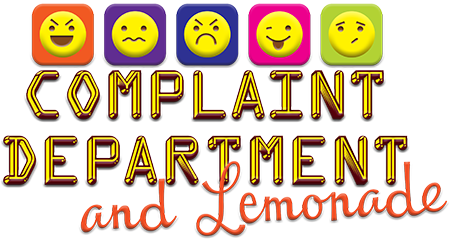 In this rapid succession of hysterical grievances, the complaint department takes on everything from Oreo icing to kleptomania and from songs stuck in the head to the price of cheese and on and on and on. Could there be a glimmer of hope for anyone in charge of a complaint department? With a clever concept of rotating each complainant into the seat behind the desk, each character not only airs their own grievances, but must also focus on someone else’s problem and assist them with their complaint. All the roles are extremely balanced to give everyone their moment in the spotlight. Read more...Or, since no more than two people are ever onstage simultaneously, extensive doubling offers actors the challenge of creating multiple characters. With extremely simple production needs, this fun and fast-paced one act can be performed just about anywhere and is a clever contest piece.